The ‘White Screen of Death‘ (WSoD) is a well-documented WordPress error which can stem from a number of different causes, and is every bit as annoying as its blue-colored Windows cousin. What makes this error so troublesome is the complete lack of any error messages when it occurs, which can make it a nightmare to troubleshoot. Thankfully, the WordPress community is nothing if not resourceful, and over time they have discovered how to tackle the most common sources of the White Screen of Death. Still, due to the nature of this error, solving it will often require you to troubleshoot your WordPress install from top to bottom in order to find the culprit. Before we delve into the troubleshooting process, let’s take a moment to go over the most common causes of the WSoD. What Causes the White Screen of Death? A low memory limit set by your hosting service, which is most often seen in shared hosting scenarios. A theme not playing nice with one of your plugins or vice versa. A poorly coded theme or plugin causing an error when WordPress is updated. A compatibility issue between plugins. Don’t worry, we’ll be going into more details regarding each one of these possibilities in their own sections while covering the troubleshooting process. If you’re reading this article, chances are that you’ve run into the WSoD at one point or another. What you may not be aware of is that it’s been known to affect random parts of WordPress sites in different cases. While some may find the white screen when trying to access their dashboard, others may find it only affects their front end or just a specific page. So, how do you fix an error that can strike random sections of your site and doesn’t provide you with any useful information? By leaving no stone unturned, of course. Since we know the most common causes of the WSoD, all you need to do is check each of them, in order, to find exactly where the error lies. Since the WSoD usually affects the WordPress admin panel, we’re going to teach you how to troubleshoot the issue using a File Transfer Protocol (FTP) manager. If you haven’t had the chance to get acquainted with FTP yet, don’t worry – it’s pretty simple. Take a minute to read through that guide if necessary, and when you’re done, open your FTP manager of choice. For the purposes of this guide we’re going to be using FileZilla, but there are other solid alternatives, such as CuteFTP and SmartFTP. When people talk about memory in the context of WordPress, they’re usually referring to PHP memory, which is allocated for plugins or any sort of files to execute their scripts. As we mentioned in the What Causes the ‘White Screen of Death’ section, this is most likely to happen due to hosting limitations. It is one of the most common errors you might run into while using WordPress and it’s pretty easy to fix, so open that FTP manager and let’s get to work! N.B. some hosts won’t enable you to increase your PHP memory limits directly, and in such a case, you might have to contact their support staff in order to ask them to do it for you. Save and close the file and check if the error persists on your site. Be sure not to make any other wild changes on your wp-config.php file unless you want to end up with an even more broken site. If this didn’t fix the error for you, it’s time to move on to the next step. Over the course of your relationship with WordPress you’re likely to accumulate a lot of plugins, and sooner or later you’ll run into an error related to one or more of them – it’s just a fact of life. However, troubleshooting these issues can be quite simple, even if they’re as serious as the White Screen of Death. Once that’s done, check if your site is working. Even if WordPress can’t load your plugins, you should be able to access your dashboard without any issues if the source of the WSoD was one of those we deactivated. Now, if the error is gone, it’s time to return your plugins folder to normal and look for the real culprit inside. 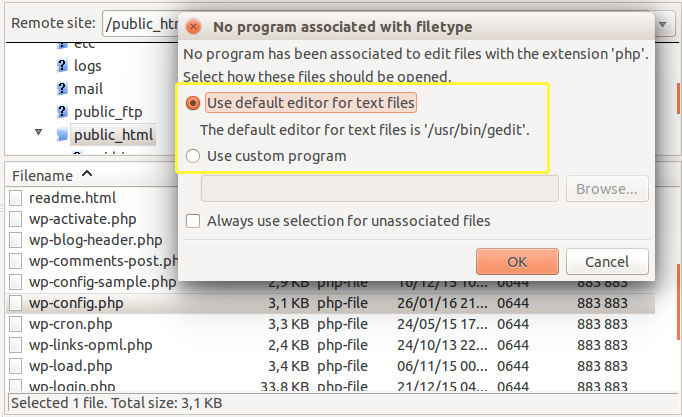 To do this, you simply have to repeat the same process as with the plugins folder itself. Rename each individual plugin’s folder, which will force it to deactivate and check if the WSoD persists on your site. If one of your plugins turns out to be the source of the WSoD, you have several courses of action. The first would be to outright delete that plugin if it doesn’t perform a function vital to your site, in which case you can always see if there are any comparable alternatives out there (which, since we’re talking about WordPress, there probably are). However, if you’re fully committed to the plugin in question, your options are a bit more limited. First of all, check if you had the latest version installed, and if not, get that updated version and upload it using your FTP manager, then check if that solved the issue. If that doesn’t do the trick, you can reach out to the plugin’s developers for support. Finally, if none of the steps above took care of your White Screen of Death, then it’s time to check out whether you have a problem with your theme. If your WSoD issue isn’t a problem with your PHP memory limit or a plugin compatibility issue, we’re down to either your theme, or aliens. Sadly, we can only provide help with the former, but feel free to contact NASA if you think the latter is more likely. Once that’s done, access your site and see if the White Screen of Death error still persists. If it’s gone, the issue was likely to be a compatibility error between your former theme and your current version of WordPress, since we already discarded the plugin factor. But wait – what if none of these steps fixed your WSoD? Then it’s time to break out the magnifying glass. The first line of said code activates the debug mode; the second instructs WordPress to save the debug output in a debug.log file which will be created in the same directory as wp-config.php, and the final line of code tells it not to display the errors it finds on your site. This way, you can go over your error logs calmly without worrying about scaring (even more) visitors away. Hopefully, a quick look at your error log will point you in the right direction in order to fix your WSoD. Don’t worry – the log itself is pretty easy to interpret, even if you don’t have much coding experience. Any error logged will display both its source within your WordPress directory and a timestamp, making it easy to narrow down the source of your woes. Once you’ve found the real culprit, which is likely to be a theme or plugin that made it past the previous troubleshooting rounds, repeat the steps we outlined until the WSoD is gone for good. If you want to unlock some of the debug mode’s more advanced capabilities, we also wrote a small tutorial on the subject a while back. The White Screen of Death can be pretty scary, thanks in part due to sounding like a death metal album. However, once you’re aware of the factors which may cause it and have gone through the process of troubleshooting your site back from it, you’ll be more than prepared to tackle anything that WordPress might throw at you. Troubleshoot directly from your FTP server if you can’t access your WordPress Dashboard. If all else fails, activate the WordPress debug mode and check your resulting logs. What’s the worst error you’ve run into while using WordPress and how did you solve it? Share your horror stories with us in the comments section below! I wonder if this caused my WSoD. I recently looked at adding caching and added W3 Total Cache. After installing and setting up, my site went total white. Had to uninstall and use a backup to get it going again. Now I am afraid to try another cache solution even though I really need something to speed up load time. It was probably a plugin compatibility issue – W3 Total Cache is a very solid plugin. Besides, as long as you have a backup and FTP access, with an issue caused by a new plugin, you can revert very quickly. I’d like a closer look at what other plugins you have – the problem will probably be there somewhere. I currently have the theme Divi with Bloom and Monarch. Plugins include Advanced Data Base Cleaner, Better Search, Child Theme Configurator Pro, Divi Booster, Lazy Load, Mango Buttons, Premium Floating Social Media Icons, Updraft Plus, Theme Check, Wordfense and WP Lightbox Ultimate. I could have used this post over the weekend! We got the problem fixed, but had to nuke the WordPress install and restore a backup. Thanks for the good article! One question though. You mentioned the php memory limit. Why do you suggest 64MB? Is it to limit WP’s load on the server or to grant more memory to WP? In other words: would WP run even better and less prone to crashes if I would set that very config to 128MB or would that allow WP to create an even bigger load on the memory, take away much needed ressources from other running tasks and thus even make a white screen of death more likely? There is no ‘best’ answer in terms of the PHP memory limit – it depends a great deal on the specifics of your setup. I’d go with 64mb and leave it there if any issues you’ve had resolve themselves. I read allot of posts and sat for a week trying solve this. At times when a plugin is coded erroneously it can precipitate that blunder on enactment and de-initiation, for the most part it’s do to a void PHP line at the highest point of a document. On the off chance that regardless you have the mistake I suggest likewise taking a stab at exchanging subjects incase its your topic bringing about the blunder. Another great post Tom. I’ve never had this happen but I will save this just in case! All of you at ET do such a fabulous job and these totally informative posts keep me from pulling my hair out LOL. Thanks Elizabeth – we do our best! In this post, we’re talking specifically about the WSoD, which is quite simply, a blank (i.e. white) screen. You need this article: https://www.elegantthemes.com/blog/tips-tricks/how-to-fix-the-500-internal-server-error-on-your-wordpress-website/. Hope that helps! Last week I updated WordPress to 4.5 plus updates Extra theme to 1.3.4. After update I got a white screen. Because no time, I put back my backup. Cannot imagine that these updates are suddenly the problem. My worst scenario was the failure of WordPress and WooCommerce to play nicely when I transferred the domain name to my shared domain space and had it use the new domain name…. It was such a tangled web, I did a fresh install of WordPress – including setting Everything up from scratch so as not to import any nasty pieces of code referring to the previous temporary URL. Things were made even more confusing as I uncovered several bugs in several plugins! All reported, all replicated and one of three sorted out. Things are stable now and I’ve worked around the bugs but its caused more work than should ever have been necessary. To top it off I originally advised against developing on the temporary url… if only people would listen! I’m glad you’ve fixed the problem! Great stuff! Some times WordPress maintenance files may also cause this issue. For memory limit, if the user is using PHP 7 will it cause the same issue ? Chris, I’m not sure on that one – maybe a quick Google search would give you an answer? Tom Ewer now you was my hero, thanks for help me to bring three of my sites from WSoD, unfortunetly on two site was Monarch plugin.